The "Climbing Plants" Ebook is 102 pages packed with great pictures and ideas on how to use climbing plants in the garden. Written by John Mason and staff of ACS Distance Education, the "Climbing Plants" ebook is a great way to get to know the kinds of climbing plants that can be used in landscaping. 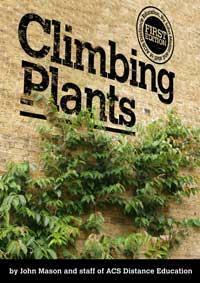 Climbers are versatile plants that can serve the same purpose as shrubs, while using less space. They can be used to hide unsightly walls, fence off boundaries and provide shelter or shade growing over walls or roofs of structures, such as pergolas, arches and arbours. This book is a fantastic guide to climbers complete with full colour photographs, ideal for everyone from the gardening enthusiast to landscape designers.